You are at:Home»Movies»Rambo: New Blood TV Series in the Works, But Will the Fans Get to Win This Time? It looks like you can’t keep a good 1980s action hero down. John James Rambo, the eponymous hero of the Rambo franchise who helped define the 1980s era of the manly men of action movies, is coming back with a new TV series called Rambo: New Blood. Ah…the ’80s. They were a simpler time, when action movies were actually good, and franchises like Rambo and Die Hard were still awesome without awful sequels. It looks like the Fox Network is likely the one to blame for this recent development. The network inked a development deal that will see original franchise star Sylvester Stallone to executive produce a new show. The latest rumors on the project say that the *69-year-old* Stallone could return to play one of his most notable starring roles that would follow Rambo and, god help me, his son J.R. (Get it?) The show would explore Rambo’s relationship with his son, who is also an ex-Navy SEAL. Now, there are a couple things to look at. This is only a development deal, and there are many stages this show must go through before it becomes a reality. It might not get to the pilot stage, and even if it makes it to the pilot stage, the show might not get picked up for series. That was the case with the Beverly Hills Cop TV show a couple years ago. In addition, Rambo rights’ holder Nu Image/Millenium Films and Entertainment One tried to get this series off the ground in 2013, and it didn’t take. 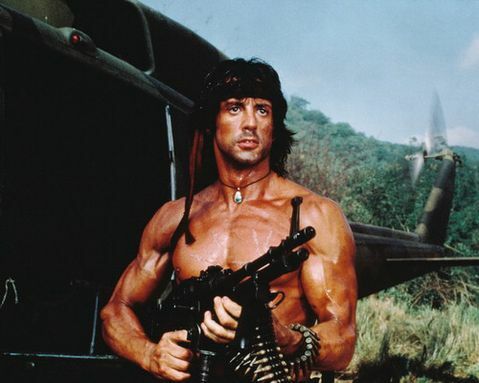 Not to mention, does anyone really want to see a 70-year-old John Rambo? Wasn’t the fact that John Rambo only grossed $40 million at the US box office enough to show that perhaps it is best to leave this alone? If not, how about that 1980s Rambo: The Force of Freedom cartoon? It was essentially a knockoff of G.I. Joe. That was back when the powers-that-be tried to turn all the cool 1980s action movies into kids cartoons as vehicles to sell lots of toys. Sometimes it worked, like with The Real Ghostbusters; and sometimes, it didn’t with the Rambo show. The other major red flag for this concept is saddling Rambo with a kid named J.R. First off, that joke is lame. Second, when the hell did Rambo get a freaking kid? There’s been a four-film franchise and nothing to indicate he had a son somewhere on the side. The kid angle always seems to be the weakest and uncreative way to give new audiences a window to revive an aging franchise. So basically, the show will have to draw you in to a story about Rambo Jr., possibly sometimes getting help from Old Man Rambo. So far, nothing for this project indicates that Rambo will get to win this time.